Invading Iraq will inflame sentiment in the Arab world, creating more anti-American terrorism. The author wants the viewer to oppose war against Iraq, and probably to take action (march, write letters, talk to friends, etc.) against it. 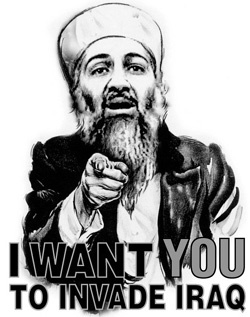 Substituting Osama bin Laden for Uncle Sam in James Montgomery Flagg's famous poster, plants the idea that support of the war might actually bring about the terrorism the government claims it will defeat. Even though anti-war sentiment was nearly closed out of the media after the US attacked Iraq in March 2003, arguments like this led to a vigorous and growing anti-war movement in the weeks and months leading up to the attack. However, arguments such as the one presented in this poster attempt to stimulate thought and reason, and lack the visceral impact of those in The Demon Saddam poster.